“Lord, if it be Thou, bid me come unto Thee on the water!” (Matt 14:28). Though there were twelve disciples in the ship, only Peter had the longing to go to Jesus, braving the wild winds and waters. In the same way, though many have been met by Jesus and know His loving grace and wonderful power, there are only very few who, like Peter, venture to go to Him. Others may have given the lame excuse of the sea being rough or the waves being wild, for refraining from going to Jesus. Some children of God want to go to Jesus without walking on the water. ‘Waters’ refer to trials, difficulties and sinful temptations. Without overcoming these, we can never go to Jesus. Peter did not walk in the water, but on the water. Dear child of God, if you walk in sin you can never go to Jesus. Jesus walked on the water and showed an example that we too may walk over all sins, trials and temptations, without getting drowned in them. Living above sin while in this mortal body, is indeed a possibility by the grace of God. Jesus walking on the water was a shadow of this truth. 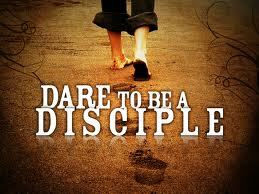 Like Peter, let us also dare to go to Jesus.